This card is entered into this week's Crazy Crafters' Team Projects Highlights. Click here to see all the other great projects and vote for your favourites. A few weeks ago I shared with everyone a card I had made for my husband that featured a porthole with a fish swimming in a shower gel sea! You can see that card here. At the time I mentioned that I had yet to perfect the process because the fish was deteriorating in the gel after a few days, despite the layers of clear heat embossing. A reader by the name of Rachel came up with the genius suggestion of laminating the fish which I thought was brilliant and couldn't wait to try it! Well, it works!!! The laminated fish stays pristine inside the gel! I made this fish at the same time as the one in the previous card so it seemed an ideal test! I laminated it and then carefully cut around it, being sure to leave sufficient margin to retain the integrity of the lamination. It has now been in the gel for several days and still looks perfect! The poor fish is a bit cramped in that jar but he's coping! So .... here's a HUGE shout out of gratitude to Rachel for solving my problem! You are amazing and wherever you are, take a bow! I'm not entirely happy with the card itself - it started out simply as a test prototype and sort of grew from there and I think that shows - it's not the most cohesive card I've ever made - but I'm so happy with the success of the process that I don't mind sharing it! My brother-in-law liked the card I made for my husband and said he'd like something similar (his nickname is The Fish), so I tried to keep a masculine look. 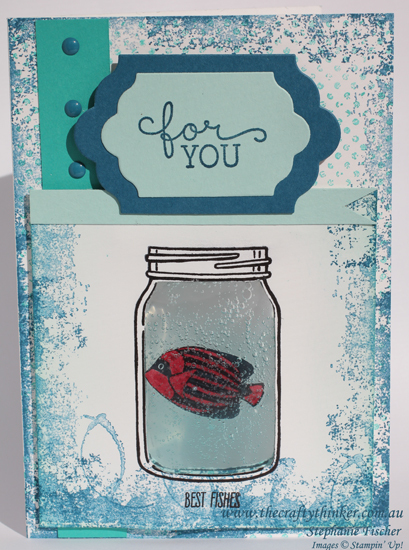 The front of the card is stamped in Bermuda Bay and Dapper Denim (stamped off) using the Touches of Texture stamp set. I added a strip of Bermuda Bay cardstock and some Dapper Denim Enamel Shapes. I stamped the greeting from Birthday Blooms onto Pool Party cardstock with Dapper Denim ink, cut it out with one of the dies from Lots of Labels and then cut a mat for it from Dapper Denim cardstock. I made a narrow banner from Pool Party cardstock for the top of the jar panel and then adhered the greeting label with dimensionals. I kept things really simple inside the card to make the fish the star of the show. 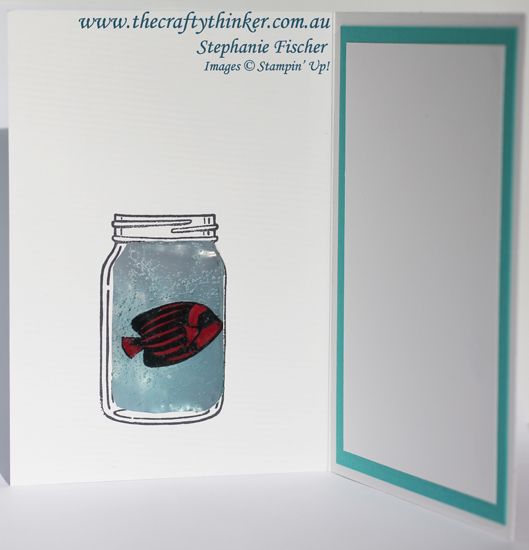 I kept the inside of the card quite plain, because I didn't want to detract from the fish.